Welcome to one of the most innovative curved stairlifts in the world. With its low running costs, it even operates through a power cut. The sleek, smooth and modern rail system is unique to these Acorn curved stairlifts. There is no waiting weeks to have an expensive rail made for your home, utilising the Acorn FastTrack® system, it can be installed in a matter of days with no mess and no fuss. All of Acorn’s curved stairlifts have been independently tested and certified to comply with the newest European safety standard for curved stairlifts, BS EN 81-40:2008, as well as the worldwide standard for curved stairlifts, ISO 9836-2:2000. 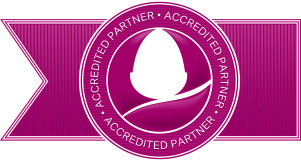 Contact us for FREE no obligation advice and speak to one of our friendly experts, Call 0800 0169 270. Slim curved stairlifts design with fold-away seat, foot rest and arms. Single curved stairlifts rail that uses an innovative FastTrack® system (unique to Acorn), which means an attractive rail with fast installation times. These Acorn curved stairlifts can be safely locked and deactivated with a key. 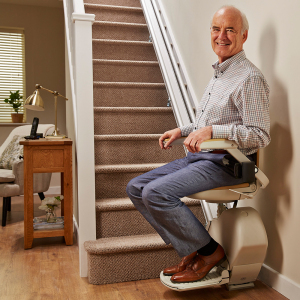 Five safety sensors surround the Acorn stairlifts to stop it if it meets an obstruction on the stairs.